Since its creation in 1861, the Medal of Honor has recognized the acts of valor of 3,469 veterans. 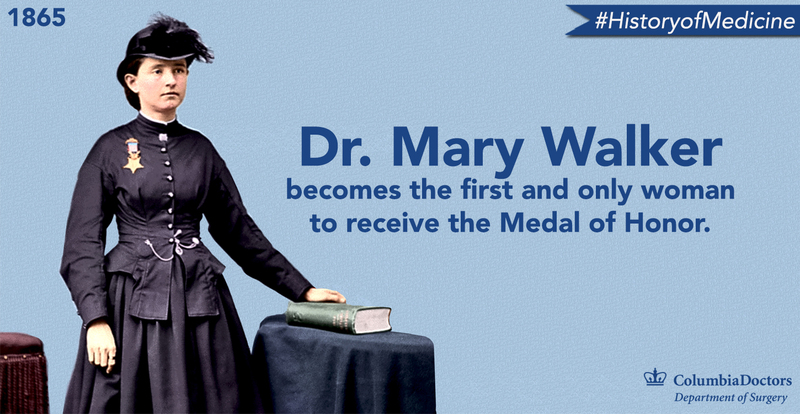 Of those, precisely one was awarded to a woman: Dr. Mary Edwards Walker, in 1865. A physician and surgeon from upstate New York, Dr. Walker began her military service as a nurse and volunteer surgeon, since the Army would not hire a female surgeon. Her skills and dedication soon earned her a promotion as the first female surgeon in the U.S. Army, under commanding officer Col. Dan McCook. In addition to treating soldiers on the field, Dr. Walker was devoted to treating the sick and wounded who were barely surviving in the nearby Georgia swamps, tending to them even when that meant risking her life to cross enemy lines. In 1864 she was captured and held as a prisoner of war. Dr. Walker’s bravery was evident not only on the battlefield, but in her outspoken advocacy for women’s rights and healthcare. She was a controversial figure, primarily for her positions regarding women’s suffrage and for wearing men’s clothing, which led to frequent arrests. In 1917, the U.S. government changed the criteria for the Medal of Honor to include only "actual combat with the enemy” and demanded that she return her Medal. In her trademark style she refused to send it back, however, and wore it till the day she died. After a campaign by family members to reinstate her Medal, President Jimmy Carter posthumously restored the honor in 1977.